At least 80% of its habitat has been lost to wheat cultivation over the past 80 years. It is restricted to dry slopes within this habitat, and we suspect an overall 40% decline of subpopulations within the past three generations (90 years). Subpopulations are small, typically fewer than 100 individuals. Decline is ongoing due to alien plant invasion, livestock trampling and collection for horticultural purposes. Bot River to Riversdale, and around Bredasdorp southwards to Cape Agulhas. Also in Breede River Valley between Swellendam and Ashton. Heavy clay soils in exposed rocky shale slopes and cliffs in Rûens Silcrete Renosterveld. 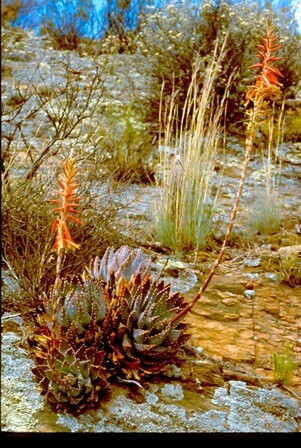 A. brevifolia is mainly restricted to Rûens Shale Renosterveld, which has been classified as Critically Endangered according to the National Spatial Biodiversity Assessment (Rouget et al 2004) as less than 20% of this vegetation type remains intact due to extensive transformation by agriculture. 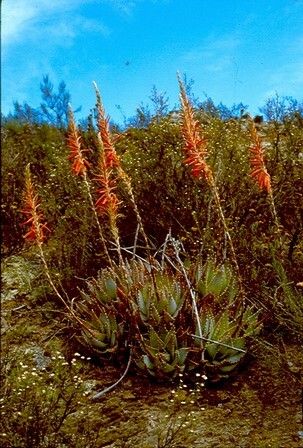 (Mucina and Rutherford 2006 recognizes three vegetation types within this broader unit - Western (13% remaining), Central (13% remaining) and Eastern (19% remaining) Rûens Shale Renosterveld). Although there is not a linear relationship between the distribution of A. brevifolia var. brevifolia sub populations and Ruens Shale Renosterveld as the species prefers slopes to flat areas we therefore suspect that at least 40 % of this species habitat has been lost in the past 3 generations (90 years) to wheat farming. Subpopulations of Aloe brevifolia are restricted to small fragments of remaining vegetation amidst a sea of wheat fields that are often degraded due to lack of fire and encroachment by alien invasive grasses and Acacias. Surveyed subpopulations are small (<100 mature individuals) and quite likely remnants of former more extensive subpopulations, and may not be viable in the long term. Removal of mature individuals by succulent collectors is also causing an ongoing decline. Some of the subpopulations on the Agulhas plain are threatened by livestock trampling.